I need clear and detailed explanation on the Smelting function and Expander (not sure if it's called Expander or Expansion) function that are associated with the new Chaos Tower update. GM and coder want to code these functions and put them on website, but they don't know what these functions are, how they work, what items are involved, the point system, etc. I also do not know these functions because they were never introduced in Fantasia where I came from before. So I would appreciate if players who know about these functions can explain what they are, how they work, the NPCs, the items, etc. 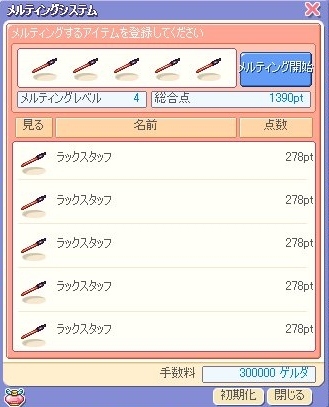 If we want to make these functions available in our server, please help. Thank you. Haha. Those JP pages. I can't read them. I was wondering if any players have had experience with these functions before and can tell the steps involved, the items allowed for smelting, items not allowed (e.g., are legendary uniques, absolute uniques, pets, fashion, forms allowed?). How are the points for each item calculated? (Actually there is a formula for the points). Just anything that help clarify the whole thing further; that's what I'm looking for. Coder and GM are working on this and I thought it would be nice if we can have this for our server; those extra equips we have from myshop that are 2 slots, for example, and are useless, could be disposed of beneficially using smelting. 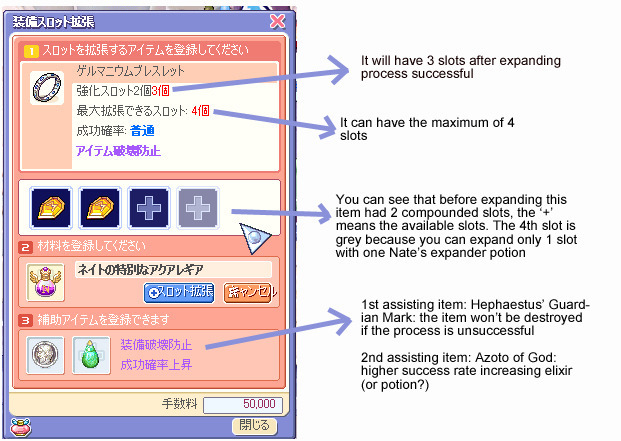 According to google translate and this article Old equipments, Absolute Unique and Form items cannot be melted and - if I get it right - the equipments whose slots have been expanded? Edited by Nariann, 01 December 2014 - 12:09 AM. One trick I learned was copying the page link and putting it into google translate. This will translate the page for you. But the pictures won't be translated. I could try and translate the pictures since I can read Korean. But I'd still have to use google translate since my Korean is pretty crappy. 8D;. Originally in kTO this system was performed by Professor Komby who developed this new method. 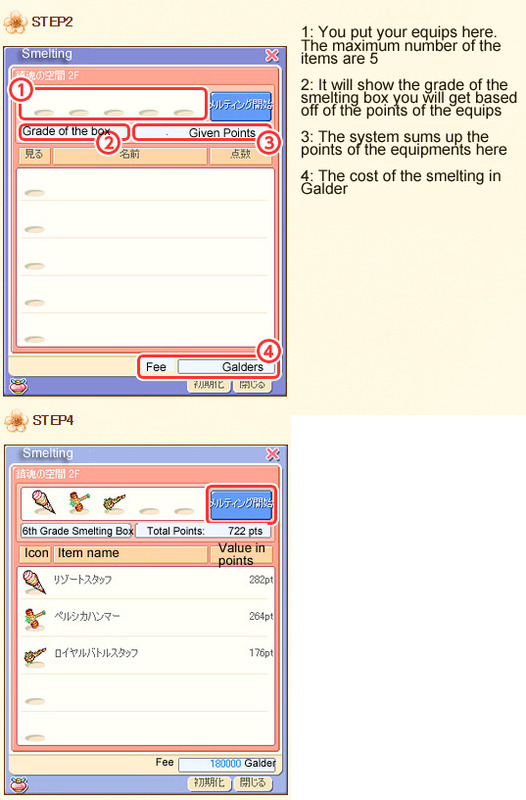 You can get these potions from the Grade Melting Boxes (sorry, the picture says Smelting :'D). There are 9 type of these boxes, the 1st Grade Melting Boxes are contain best and 9th Grade Melting Boxes contain the worst items. 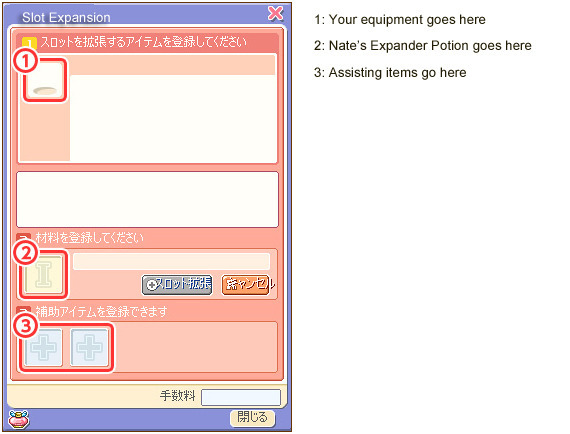 Then again, I don't know the differences between the two potions. Boss Uniques (Golden Sword, Blood Shield, etc.) can have up to 5 slots while the other 'normal' equips can have 4 slots max. Edited by Nariann, 01 December 2014 - 01:29 PM. Thank you for the above information. I forgot about this until GM asks about it. Do you have the formula that incorporates these values? Okay, tyty, IGM, Coder & I greatly appreciate your help, Nariann. GM & Coder has a formula; I just need to work it out based on the things you listed as point determinants above. I've open 200 9th Grade Melting box, and i didnt found the Akura of Nates.